Instead of using one large skinless boneless turkey breast, I decided to use turkey cutlets, which are a lot easier and far less time consuming to prepare. That way, there's no need to butterfly chicken breast fillets and then pound them into oblivion with a mallet just to get them to the proper thickness. :) They're already pre-cut and ready to be rolled. And how nice is that?! Also, by using cutlets, the end product turns into something else entirely, i.e., mini roulades, which I thought would be a bit more fun to prepare, as the dish then becomes an appetizer instead of a meal. Not only that, mini roulades are the perfect finger food to serve as party hors d’œuvres. Just put them on a serving platter, supply a few toothpicks, and you're ready to go! Even better, they can be made in advance and then either frozen or refrigerated for future use. Then, all you have to do is reheat them just before serving. Or, if you're really feeling lazy, they could also be served chilled, straight from the fridge, or at room temperature, if so desired. Securely tie each roulade crosswise with kitchen twine so that it holds its shape. (Or, see the Chef's Notes section below if you'd prefer to take a shortcut and forgo this step.) Here's how to do this (or you can just watch this instructional video instead): Grasp the kitchen twine with both hands, placing the short end in your dominant hand. From the end of the roulade that's farthest away from you, slide the kitchen twine under the bottom of the roulade, moving it towards you about a third of the way down the roulade. Grasping the short end of the string, tie it into a tight double knot on top of the roulade. Next, while grasping the long end of the string in both hands, slide it underneath the roulade another third of the way down. Be sure to give yourself enough slack. Then while still holding the string in your hands, lift up the free end of the kitchen twine, lace it through the loop of string you're holding in the other hand, and then tug the free end upward, pulling it tight. 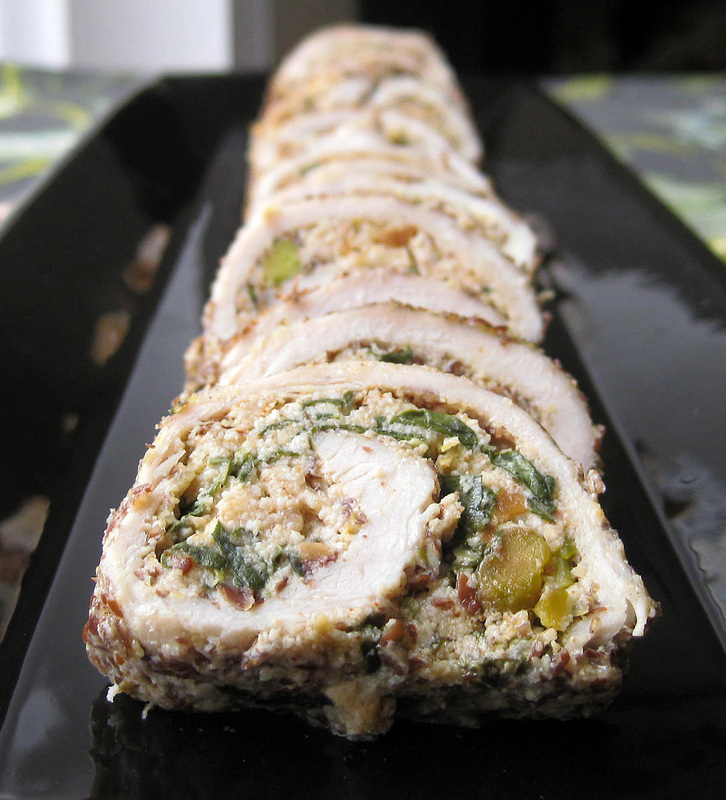 (If your roulade is unusually long, you can repeat this step again until you get closer to the other end of the roulade.) Pull the string down lengthwise, towards the end of the roulade that's closest to you, and while still holding the string in your one hand, roll it over (crosswise) onto its opposite side, and wrap the string over top of the roulade, lengthwise, to the other side. Then roll it over one more time and lift the string up to meet the other loose end, and tie it in a double knot. Repeat the process until all roulades are tied. Season the roulades with 1/8 tsp. salt (or to taste), sprinkling from a good distance above to evenly distribute. Drizzle with 1 Tbsp. extra virgin olive oil to help brown the roulades. Transfer roulades to a 7" x 11"x 1 1/2" glass baking dish and cover with aluminium foil. Roast for about 25 minutes, or until the juices run clear and meat is no longer pink on the inside. Then open oven, pull out rack with baking dish, and remove aluminium foil. Continue to bake for another 10-15 minutes, or until tender when pierced with a fork. Allow to cool for 10 minutes, then transfer to a large cutting board. Using poultry scissors, remove kitchen twine from turkey. With a sharp knife, cut roulades crosswise into 1/4 - 3/8" thick rounds, about 5 rounds per roulade. Place onto a large serving platter, providing toothpicks on the side, and serve warm or at room temperature. Can be made a day in advance and chilled in a covered container in the refrigerator. Chef's Notes: So, now that you've learned how to lace poultry, here are the rolling instructions for lazy people. :) --> Some people swear by metal poultry lacing pins, using them as a needle to lace the twine, but in truth, all you really need is kitchen twine or if you're really pressed for time, nothing at all. That simplifies things considerably. No fuss, no muss. To be 100% honest, I made these roulades without using any twine at all and as you can see from the above photo, they stayed in one piece when I sliced them into rounds. If you take the easy way out, just be sure that you roll the roulades really tightly, tuck the ends under, and tightly nestle them next to one other when you put them into the glass baking dish, so they don't start to unravel. IMPORTANT: Some people like to use toothpicks to help them secure the roulades while they tie them together, but if you do this, just make sure that you remove the toothpicks before placing the baking dish into the oven. For future reference, toothpicks can actually be placed into the oven, but they must first be soaked in warm water for 10-20 minutes, in order to prevent them from burning, or worse, starting a kitchen fire. Personally, the idea of using toothpicks in an oven makes me rather nervous, so I'd rather just use the kitchen twine and avoid potential kitchen mishaps. On that note, it's VERY IMPORTANT that you use kitchen twine (sometimes also called cooking or butcher's twine) and not generic household string, because the latter will set on fire if placed into the oven. So please be aware of these fire hazards!